Party General Secretary Nong Duc Manh arrived in Moscow on July 8 to begin his official friendship visit to Russia. Foreign Minister Aleksey Borodavkin welcomes Party General Secretary Nong Duc Manh at Sheremenchevo II, Moscow on July 8, 2010. 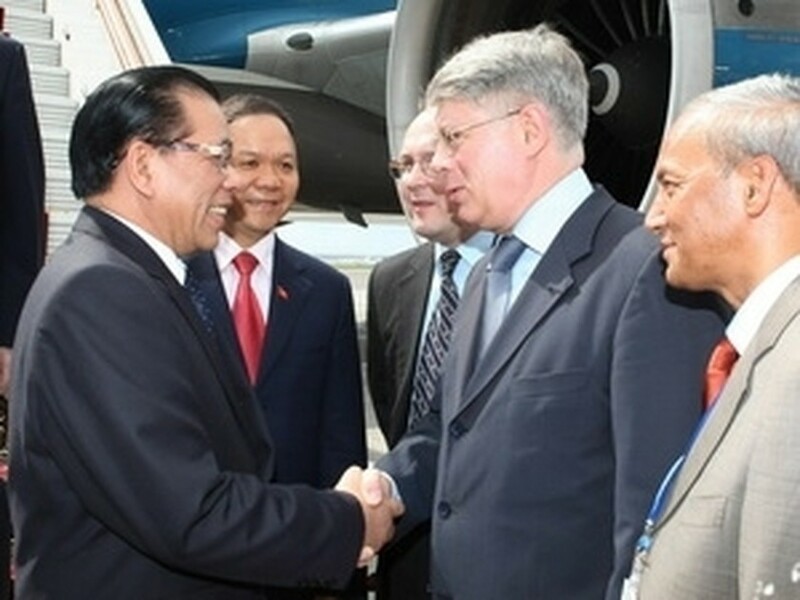 He was welcomed by Deputy Foreign Minister Aleksey Borodavkin, Russian Ambassador to Vietnam Andrey Kovtun and other senior Russian officials. Vietnamese ambassador to Russia Bui Dinh Dinh and ambassadors of ASEAN member countries in Russia were also present at the welcoming ceremony. As scheduled, General Secretary Manh will hold talks with Russian President Dmitry Medvedev on July 9. The same day, he will meet with the Speakers of the State Duma (the lower house of the parliament) and the Federation Council (the upper house of the parliament). Party General Secretary Nong Duc Manh’s visit to Russia aims to discuss ‘the expansion of Russian-Vietnamese economic and political interaction,” said Russia ’s Itar-Tass news agency. Itar-Tass also said that the visit is being made at the invitation of Russian President Dmitry Medvedev and a high-level Russian-Vietnamese talks will be held on July 9 at the Kremlin. Both parties expect to sign four cooperation agreements in the oil and gas sector which is a highlight in bilateral cooperation, said Itar-Tass, adding the Vietnamese-Russian joint venture “Vietsovpetro”, has emerged as one of the world’s leading oil companies. Both parties will also discuss the construction of Vietnam ’s first nuclear power plant in the central province of Ninh Thuan which is expected to begin in 2014 and be commissioned in 2020 as well as tourism. Itar-Tass said that bilateral trade relations are also rising with reciprocal trade earning 1.7 billion USD in 2009 and expected to reach 3 billion USD this year. The construction of the Hanoi cultural and business centre in Moscow and the House of Moscow building in Hanoi will also further Russia-Vietnam cooperative ties, it concluded.